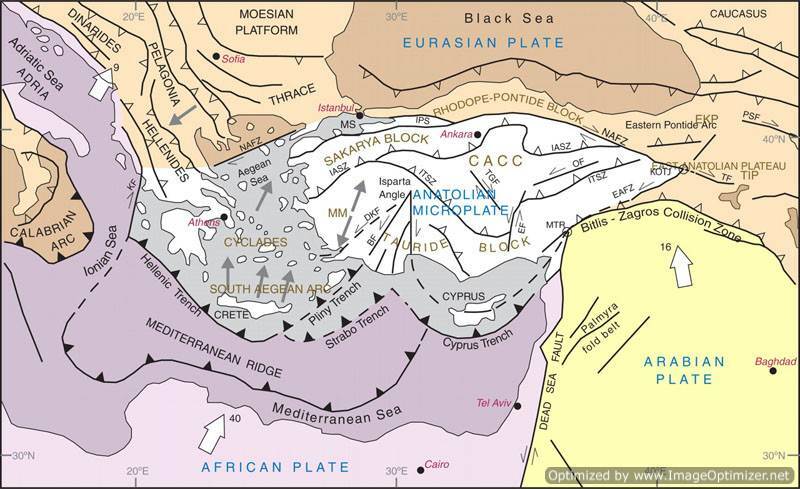 During the long geological evolution in the Aegean Sea a series of volcanoes were created. Causes of this creation were the movements of the Eurasian and African lithospheric plates. Greece is located between the two plates, which move towards each other and the geological evolution is closely linked to the evolution of the Alpine belt of Europe, created by the upheavals of the crust of the Earth during the last seventy million years. As the two plates approached each other, the African plate was sinking deep beneath the Eurasian and melt when it reached in areas with high temperatures. The melting of the materials went up and came out to the surface, forming a series of volcanoes, called the volcanic arc of the Aegean. The boundaries between the two plates are identified by large trenches at the bottom of the Mediterranean Sea south of Crete and west of the Ionian Islands. For this reason the deepest parts are located south of the Peloponnese. The geologists explain that the ditches do not match with the Aegean volcanic arc, because before the plate melt and the magma moves toward the surface, there must be some space to sink to bigger depths. The Aegean volcanic arc starts from the volcano Sousaki at the Corinth Canal and ends at the volcano of Nisyros island, passing from Attica, the islands of the Saronic Gulf and several islands of Cyclades - Milos, Santorini and Antiparos. From these volcanoes, which have small surface area, are currently active the volcanoes of Methana in the Saronic Gulf, Santorini in the Cyclades and Nisyros in the Dodecanese. On the arc of the volcanoes of the South Aegean, volcanic centers are located in the Saronic Gulf, Milos, Santorini, Nisyros and Christiana. In the interior of arc, are the volcanic centers of Antiparos, Kalymnos, Kos, Patmos and Samos. In the central Aegean volcanic centers exist in Chios, Antipsara, Skyros, Evia and some other points. In the North Aegean in the Northern Sporades, Lemnos, Lesbos, Samothraki, Imbros and Tenedos. The most famous volcano in Greece is the volcano of Santorini, as it is internationally known. Santorini or Thira covers an area of ​​75.79 sq km and constitutes a complex of volcanic islands which also includes Thirasia, Aspronisi, Palea and Nea Kameni. It has crescent shape, which is completed by a ring of islets, Thirassia and Aspronisi. In the middle, a caldera is formed, a large basin created by a large explosion in the old days, which resulted a part of the island to be submerged. Inside the caldera are Palea Kameni and Nea Kameni, created by lava. 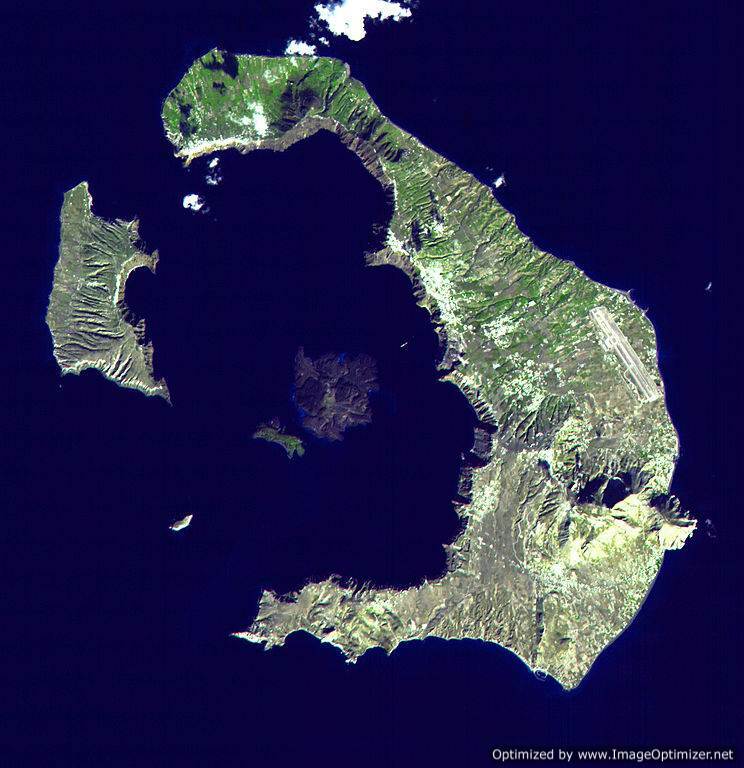 The volcano of Santorini was active during the Pleistocene period. In the beginning there was a small island south of the present location. At that time it seems that through the cracks the magma found a way out of an underground chamber and the first explosion took place. Other explosions followed, resulting lavas and tuffs to cover in part the older rocks and the solidified rocks became a larger island with the highest ground in a round shape, from where the name of island Strongili (round) came from. The great eruption occurred in 1500 BC. Large amounts of ashes covered much of the central part of Strongili, which sank, while an entire city, the famous Akrotiri, buried. 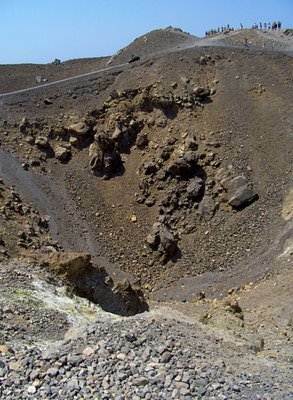 The roof of the volcano fell and the outer portions that remain are now Thira, Thirassia and Aspronisi. In the center of the sea, a caldera formed. The explosion was followed by earthquakes and sea waves causing great damage not only to the neighboring islands of the southern Aegean also to others farther away. Hundreds of years passed until the volcano turned active again in 197 BC. It was then that Palea Kameni was created. Again, hundreds of years passed till the next explosion, in 1573. New events in 1707 - 1711 made Nea Kameni ​​to emerge. In 1866 - 1870 the domes of St. George and Afroessa were created and joined the Nea Kameni. 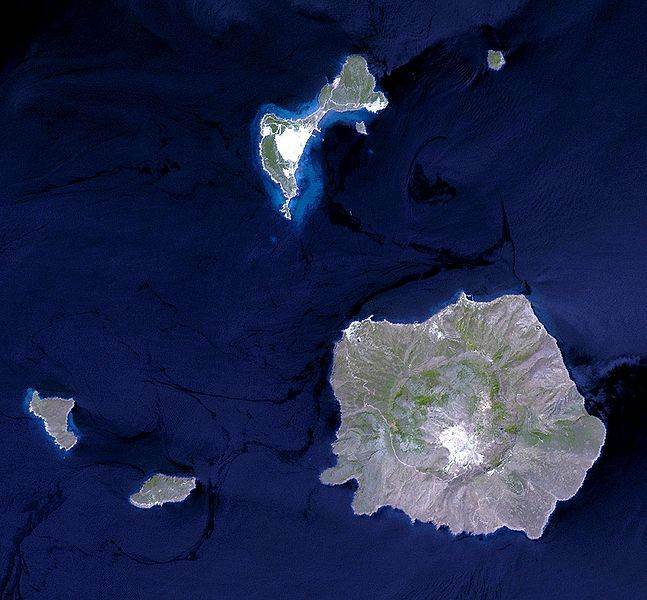 In the 20th century the volcano was active mainly from 1925 to 1926, in 1928, from 1939 to 1941 and 1950 bringing to light new small islands, all united in one, the New Kamenes. From the volcanic tuffs of Thera, the Theraic terra is being utilized, a volcanic material that covers much of the surface in Thira, Thirassia and Aspronisi. It is a faded very fine ash from tiny grains that have the same mineralogical composition as the lavas of volcanoes. The color is reddish or brown and is composed of 67% silica, which is largest proportion is soluble and oxides of aluminum, iron, calcium, magnesium, potassium and sodium. 4.5% is water. The Theraic terra has great properties, known since the ancient times, burst easily and its extraction requires little expenses. Most important of them provide, when mixed with lime, a wet mortar that coagulates slowly and is used in hydraulic engineering and harbor construction. In Santorini operated in 1928 near the mines of the Theran terra, a factory for processing and preparation of the "flour of the Theran terra" a very fine ground material suitable for hydraulic mortars. Similar grounds can be found in Italy, in Potsouoli near Naples and in Campania. There is also in Germany. The other active volcano in the Aegean Sea is located in Nisyros island, south of Kos in the Dodecanese. Nisyros has an area of ​​41.40 sq km and round shape. Its name is ancient and, as the legend describes, was formed at the time of Gigantomachy, when Poseidon chased giant Polyvotis. The god of the sea detached a rock from Kos island and hurled it against the giant. The rock crushed Polyvotis and created the island. From geological point, Nisyros formed by the action of its volcano, called Crater which is 698 meters high. The last eruption was in 1888. Since then only fumaroles of carbon dioxide, hydrogen sulfide or sulfur vapor, coming out.